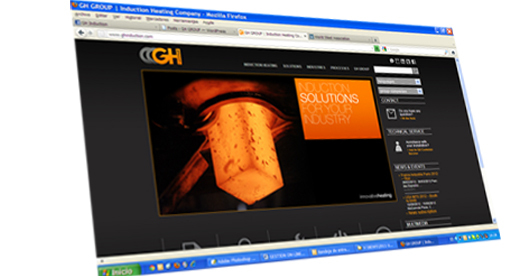 GH Group has launched four on-line communication channels: Website, Facebook page, Twitter and Linkedin. The main objective is to make easier the contact with all GH Group companies having a centralized meeting point in GH website, www.ghinduction.com. Any website visitor, either customer or not, is invited to ask directly to GH Group through our “Induction Expert” section on corporate information, products or induction applications. It is a Question & Answer tool where the visitor inputs are answered by a team leaded by the GH Group Technical Director, Mr. Miguel Mezquida. The challenge is to collect, organize and offer useful information for our visitors from all GH companies in China, India, Brazil, Spain, Germany, France, USA, Mexico and Argentina. The information will be offered as “News & Events” in the website and publish in “GH Induction” Facebook, Twitter and LinkedIn, and as documents in website, and videos in GH Induction channel in YouTube and Vimeo. The social networks pretend to be a meeting point among GH followers both for sharing experiences and for thoughts on how useful induction heating is or could be in any industry. In addition GH will try to open discussions through industry topics and news that could interest to our customers. We are waiting you in these channels.